*I was sent free products from CafePress to facilitate my review. All opinions and cheesy pictures are my own. 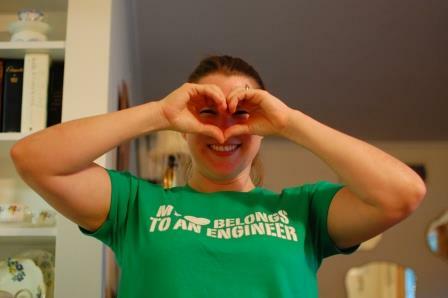 Just in time for Father's Day, I received a couple of t-shirts to review from CafePress for Engineer...and one for me about Engineer. Like I've said before, I love their "geek" section of items which include lots more than just t-shirts. They have cute shower curtains, funny mouse pads, cool cellphone cases, unique business cards, as well as the option to design your own t-shirts. This month everyone is scrambling to buy June gifts and CafePress is just the right spot to find the perfect reasonably priced gifts for grads and Dads. Engineer particularly liked this shirt even though I explained to him that only other Engineering types would even get it. 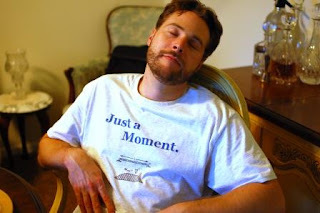 That is a moment formula underneath the "Just a moment" on his shirt. Engineer loves the fact that the t-shirt doesn't have a tag and instead the information that normally is on a tag is printed on the inside of the t-shirt instead. He also got the above shirt but hasn't worn it yet. As for my shirt, I really like the brightness of the color and the fit of the shirt - it's not too bulky like a regular t-shirt and not too tight even though it's a feminine fit. I put everything in my online shopping cart and typed in the discount code that the website was promoting for Father's Day and the gift code CafePress sent me. When I went to check out, the order page said I owed $.23 after both the discount and code but when I hit the "submit" button, the order summary said that I owed $6 and some change. This actually was quite good since it gave me a chance to try out their customer service. I contacted Customer Service via e-mail and explained the situation. Within 24 hours, I had a very courteous answer in my inbox whereby they apologized and fixed the issue straightaway and I was charged the $.23. STELLAR customer service - LOVE IT! One other slight, er, um, snafu is that my so-called "intelligent" adsense ads that are supposed to be tailored to suit what I search for most (and usually has ads for Shabby Apple or American Girl Dolls) kept popping up with CafePress ads. Okay, I don't have a problem with that since I was indeed trying to find the perfect shirts for Engineer. But the CafePress ads that were being shown with products displaying women with ah hem...large personalities if you catch my drift. As I only searched for structural engineer or geek shirts, not sure how they showed up unless it was because the size of their undergarments had to have been designed by a structural engineer. That has too been resolved and we are back to American Girl Dolls.